Sewing baby clothes is practical and fun. Learning how to sew baby clothes can be relaxing and rewarding. Whether it's for your own baby or a gift to give, hand-sewn baby clothes are straight from the heart. The time and effort taken to create such cute creations will be evident to all. In addition to sentiment, hand-sewn baby clothes can also prove a budget-saver. You can convert old clothes into new to keep up with the needs of a growing baby. Healthy and happy, babies grow at an amazing rate. One day they're coming home from the hospital. The next, they're walking around the house. To keep up with baby, you might want to sew a few garments on your own. These can be onesies, pants, jumpers, or sundresses. Start with simple patterns -- ones that will provide you sewing practice and also supply your growing baby with play clothes to get messy in. One thing is for certain: babies can get messy in a hurry. As said, hand-sewn baby clothes are also very personal. If it's for your own baby, your creations can turn into heirlooms. A pretty cotton dress made for the springtime for instance, could be saved for your future grandchildren. If you sew for someone else, such an original gift would make a wonderful surprise. Learning how to sew baby clothes is also quite green. In an Earth-conscious world, finding ways to reuse or re-purpose something can go a long way to helping reduce waste. One way is to make your own clothes. 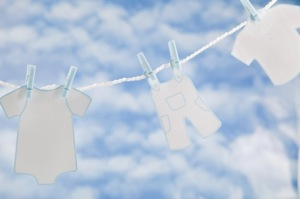 For baby, you can easily turn older adult clothes into "new" tiny clothes. For instance, you can turn an old T-shirt into toddler pants. The green ideas are out there. Once you decide to made some baby garments, you should plan and prepare. As with any craft project, you'll want to stay organized. The best way is to checklist all considerations first and then work from there. Proper measurements are critical. This is especially true if you're making the clothes for someone else. With your own baby, adjustments can be easily made, should the garment be too small or too big. For someone else, however, you'll want to be sure it fits right from the start. To do so, get at least an estimate of the baby's size so that you may measure it against your working pattern. Remember that baby clothes should be snug, but that babies grow fast. Consider the season you are sewing for, as well as if baby has any allergies. Most patterns call for cotton or sweatshirt fleece. For a baby, select fabrics that are breathable, soft, and comfortable. Be honest with your sewing skill. Simple patterns done perfectly will result in creations far superior to those made poorly from more complicated patterns. The most important thing is the end result and you will want your baby to get a lot of use out of whatever you make. Again, at the rate babies go through clothes, "simple" is often the best way to go. Safety: Embellishments are lovely, but always keep safety in mind. Just as you wouldn't buy baby clothes that had anything which could be torn off and chewed, the same logic applies to your own creation. What's more, babies need their clothes to be snug. No loose fabric. If you're sewing a sleep sack for instance, make sure it fits like a peapod. Smocking: Lastly, if you're not yet confident with sewing your own garment, you can still turn store-bought clothes into "originals" with smocking, hand-stitching, or sewn-on designs like monograms or a favorite animal. As you'll find, making baby clothes can be a fun project for anyone -- especially expectant mothers. Keep in mind too that there is a learning curve. If your sewing skills are at the beginner level, you will only get better with time and practice. Start with the simple, with an eye on the more complicated. Indeed, before you know it, you'll be ready to sew that baby cardigan for the winter!